The market’s last chaotic day closed in a way that befit the entire year. Up, down, up harder, down harder and done! 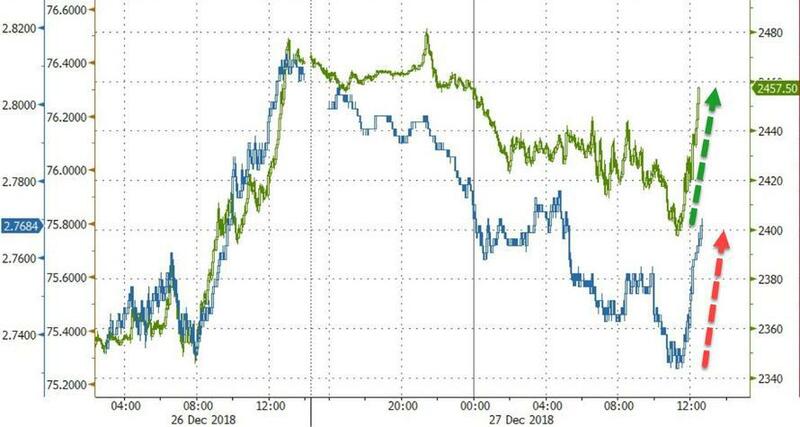 It looked like the violence of the day may have come from the Plunge Protection Team attempting to push the market up in the middle of the afternoon, except that the middle of the afternoon doesn’t fit the PPT’s MO because the birthing-sized push didn’t come in the PPT’s usual obvious final-hour press. So, what was the push in the penultimate hours all about? Was it everything the PPT could do to press the market up, and the press finally collapsed? Did the PPT try and fail? After a staggering rise (literally, as in up and down and up), the market plummeted in the final hour from a roughly 225-point positive position on the Dow down to close at about -75, leaving us with indisputably the worst December in market history by several measures or, as I called it, the December to Remember. Or maybe the PPT was content to just hold the market approximately where it got to yesterday in order to keep the bulls from coming back to life in their irrational exuberance while keeping the market from an all-out crash. All nothing better than wild guesses because few there be who really know if the PPT was even engaged at all, so clandestine are their actions. They are like the mafia that doesn’t exist as a single organization and that does most of its work underground. The PPT is not an organization but a number of entities tapped (originally) to counsel markets upward and (more recently) just to buy directly and push them upward. The PPT exists by the decree of President Ronald Reagan, who didn’t believe markets should ever be allowed to crash. Do not mistakenly think the modestly large rises and falls in today’s action by whomever were not major just because the market closed a little under flat. The factor that was historically significant (again with the historic records!) was much bigger than the overall rises and falls indicate, and that could be because the PPT hit massive resistance trading the other way today. Fed fakery or plunge team plunging the market over a cliff? This is a graph of buy orders and sell orders on the NYSE. Readings above a thousand in either direction are considered extreme. Notice today’s upticks were well above 1500 (extremely extreme), and the downticks were nearly at record levels at almost 1,500. That confirms for me that, whoever was putting in the number of upward purchases at a record rate was pushing against near-record downward selling pressure. If it was the PPT, the engines must have been really screaming behind the scenes just to hold the market a little below flat for the day. That would have to be one hugely powerful trader to put in three massive buys. If it was an attempt to pretend at being a series of major end-of year pension-fund rebalancing trades (of the kind I wrote about two days ago), it was poorly disguised because, as I explained in my previous article, rebalancing trades would be accompanied by bond sales to right the mandatory balance ratios in certain funds between bond holdings and the greatly fallen value of stock holdings, and ZH notes there were no bond sales that corresponded with today’s monumental stock trades. Putting today’s massive buy program burst in context, within just 15 minutes, we had three TICK prints that were 1,631 or higher. As a reminder, yesterday’s high TICK print – which helped send the Dow nearly 900 points higher – of 1,662 was the 4th largest buy order of all time. That means that today alone we have had three absolutely massive buy programs all within just minutes of each other. Those moves yesterday had the right chemistry to be end-of-year rebalancing, which today’s moves did not. (As pension funds sell off large amounts of their bond holdings and buy stocks, one would expect the price of those bonds to fall in order to find enough buyers (meaning the yield would rise). So, is the PPT off its game when it comes to fakery today, or did its silent players just not have the bonds to trade that pension funds were FORCED to trade at this year’s end in order to rebalance? The trade out of stocks after the big presser did, however, correspond to a big move in bonds, but it was a move into bonds (for safety) not a move out as would be the case in rebalancing. Treasury yields fell as demand suddenly soared once investors appeared to recognize the fakery for what it was. So, there is no way today’s big press was due to pension-fund rebalancing. Such recognition of fakery is where I have noted in my comments that, if the PPT is engaged, it is rapidly moving into a situation where it is becoming impotent. With a record number of bids to push stocks up today, stocks still fell like a rock as soon as the PPT (or whomever) exhausted its pressure. The Dow lost almost 400 points in the closing hour of the year. What a way to end the year, but how true to how the year has gone overall. It was this final-hour stumble off a cliff that was the most notable action of the day to me. You’ve heard me write often about the law of diminishing returns to say that the Fed’s efforts and the PPT’s efforts will at this time become far less effective. It will require greater and greater effort to push the market up against the downward pressure of the Fed’s liquidity tap wherein it is draining money out of the global monetary system. Whatever massive entity tried to lift the leaden stock market up today failed. Looks like the bulls’ testosterone was saturating their brain cells so they could only think about things going up. (I’m talking about markets.) Typical ballocks from the bulls. …It’s been a rough three months, and a particularly difficult December, for stocks, however. The Nasdaq is in a bear market while the Dow and S&P 500 are solidly in correction territory and nursing hefty December losses and year-to-date declines. Some market watchers find big bounces in such an environment less than convincing…. Indeed, market veterans warn that massive, one-day rallies are often more characteristic of downturns, occurring as selloffs lead to significantly oversold technical conditions that leave markets ripe for short covering only to give way to renewed selling once the frenzy of forced buying is exhausted…. During that time, the major U.S. stock indexes have suffered losses that put them on track for their worst December performance since the Great Depression…. These moves took place against a backdrop of economic uncertainty as a series of leading indicators showed signs of a slowdown…. IHS Markit said its U.S. composite output index fell to … a 19-month low…. Services and manufacturing PMIs also dropped to their lowest levels in about a year…. Monday’s declines looked like they were going to carry through Wednesday, when the market re-opened after the Christmas holiday. But after a brief decline, equities started surging and posted their best single-day performance in nearly a decade. But while stocks have showed significant gains over the past two sessions, it is not clear whether this week’s lows mark the bottom of this recent downturn. “I’m not sure we made a bottom…” said Maris Ogg, president at Tower Bridge Advisors. Ogg added more volatility is likely on the horizon as the fourth-quarter earnings results reflect slowing economic activity. That, indeed, is where we are headed in 2019. In order to keep these articles coming during that journey, please become a patron through the link below. Patronage at the $5 per month level will also gain you gated access to occasional special articles, such as my overview of the headwinds that will be assailing us in 2019, which I’ll be publishing shortly after the start of the year. Again, Happy New Year to all! It’s going to be interesting … really interesting.